Visit here for all Balwin homes for sale in northeast Edmonton. The average sale price for a home in Balwin so far in 2014 is sitting at $330,166. 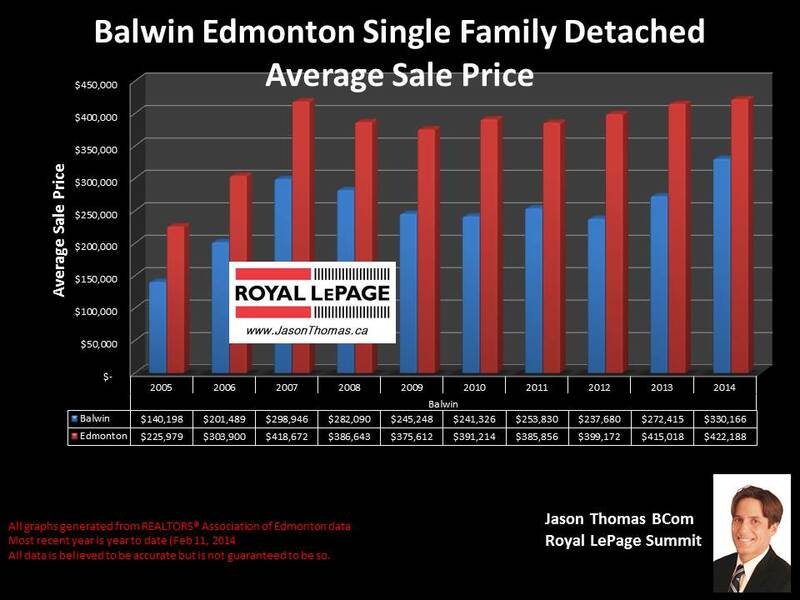 That average price is based on single family detached home sold in Balwin, and includes a small sample size of only 3 sold properties. It will be interesting to see if Balwin can maintain this high price throughout 2014. In 2013, Balwin had an average selling price of $272,415. The average time it took to sell a home in Balwin last year was 43 days. Virtually identical to the Edmonton average days on market in 2013 of 44 days. The highest sale price for a home in this northeast Edmonton neighbourhood last year was $388,000. At the other end of the price range, the most affordable home sold for $133,000. That home was essentially a knock down property and was lot value. The Balwin neighbourhood has seen it's property values appreciate by 94% from 2005 to 2013. Looking at the duplex market, the average sale price for a duplex in Balwin last year was $293,000. The highest price a duplex sold for in 2013 was $338,000. Duplexes took on average only 20 days to sell in the neighbourhood last year. In the condo market, the average selling price for a condo in Balwin last year was $179,387. The highest price that a condo sold for was $250,000. The average time to sell a condo in Balwin last year was 55 days. The condo complexes in Balwin that had a condo sell in them last year include: Balwin Manor, Laskin Court and a new townhouse complex on 71 street and 127 avenue. If you are interested in a professional no obligation market evaluation on your home click Balwin homes for sale.